W00T! 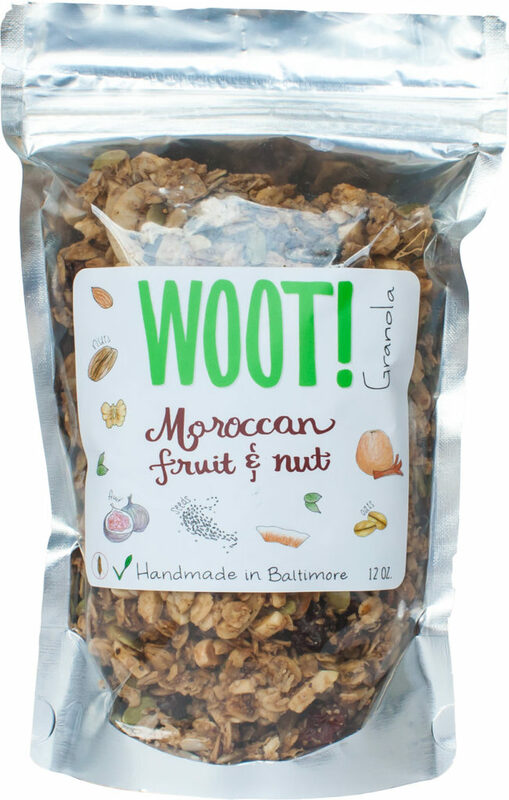 Granola | Woot! Taste, See, Smell, Feel, Nourish! W00T! 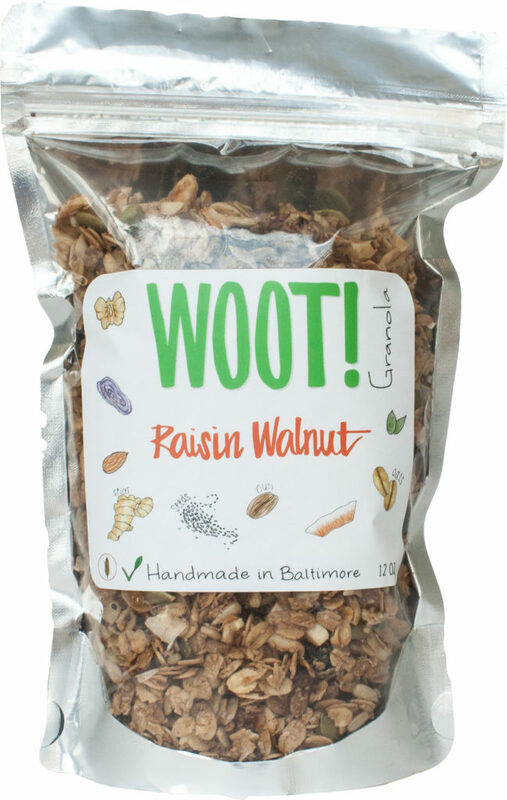 Indulge in a healthy vegan delight of nuts, seeds, dried fruit and grains lightly sweetened with Maryland Maple syrup and gently seasoned with coconut palm crystals, salt, and cinnamon. W00T! is hand-made with love in Baltimore. Start your day with W00T! Mix it with your favorite yogurt, honey or preserves, and fruit, or simply add milk. Need a pick me up during the day? W00T! is a perfect munch; a 24/7 food. 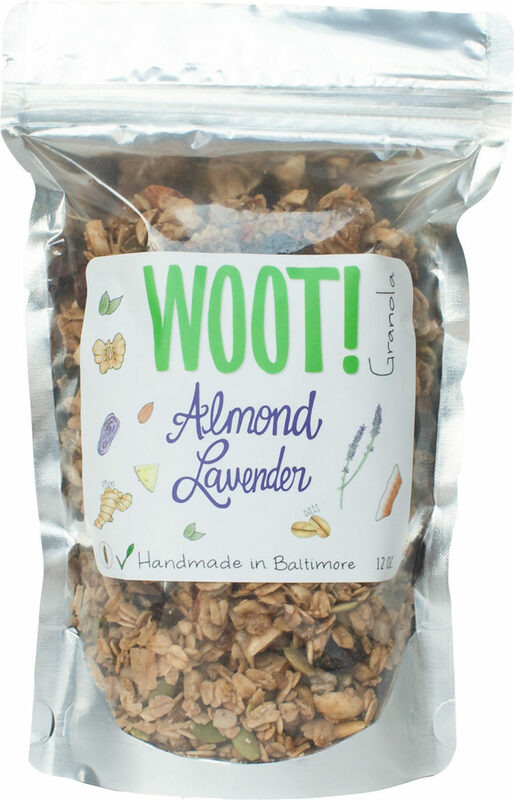 Relax at the end of the day with a bowl of W00T! to complement a glass of wine or beer, or add crunch and flavor to your favorite salads and soups. A unique blend of whole, nutritious ingredients, W00T! is handmade in small batches and slowly roasted to bring out the caramelized fruits' sweetness, the nuts' toasted goodness and the grains' comforting essences. A spicy, sweet Latin mix of dried pineapple, candied orange peel, ginger, cashew nuts and our signature nuts and seeds, enveloped in a citrus syrup spiced with cinnamon, jalapeño and cayenne pepper. 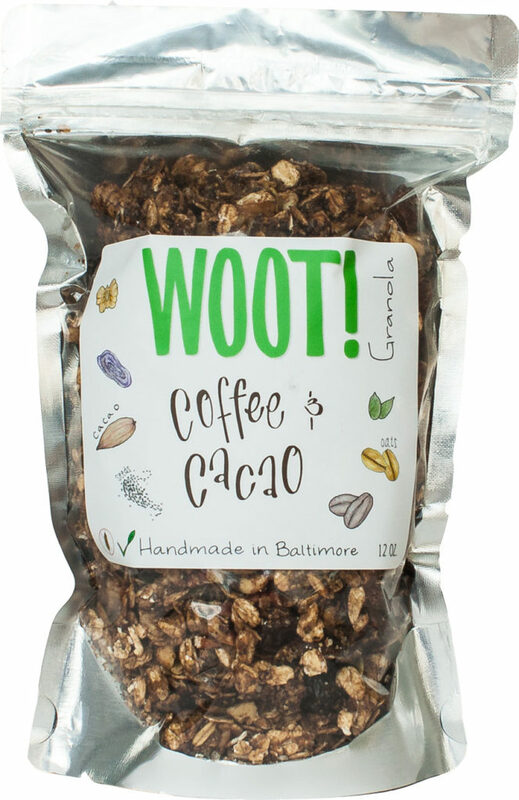 Coffee Cacao will pick you up morning, noon and night with its rich coffee and cacao taste covering a crunchy, chewy mix of dates, walnuts, raisins, almonds, sunflower, chia and flax seeds, organic oats, puffed rice and corn meal. 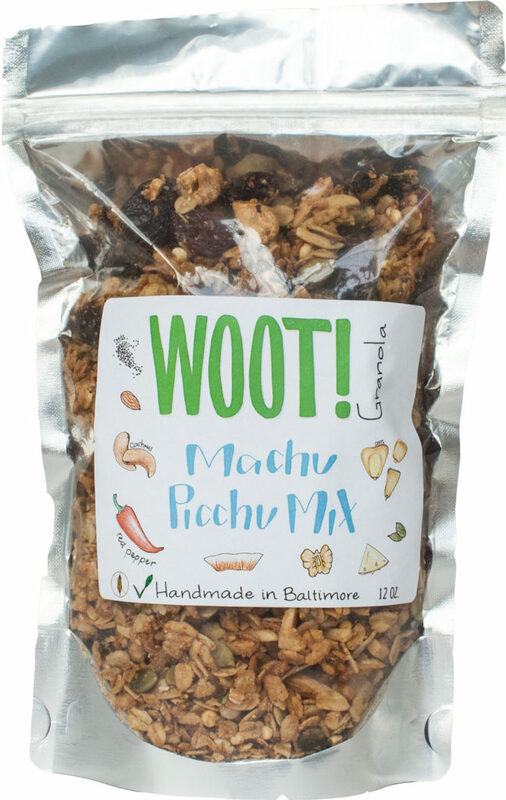 A Spring Mix packed with crunchy almonds and walnuts, juicy pineapple and raisins, sweet spicy ginger, organic rolled oats and oat bran, along with pumpkin, sunflower, chia and flax seeds. An earthy, gently sweet mix of big fresh walnuts, organic raisins, spicy-sweet ginger, crunchy nuts and seeds, a touch of Maryland Maple syrup and cinnamon. A mellow mix - naturally sweet figs, dates, raisins, crunchy nuts and seeds, candied orange peel, scented with fresh ground cardamom and a touch of Maryland Maple syrup. 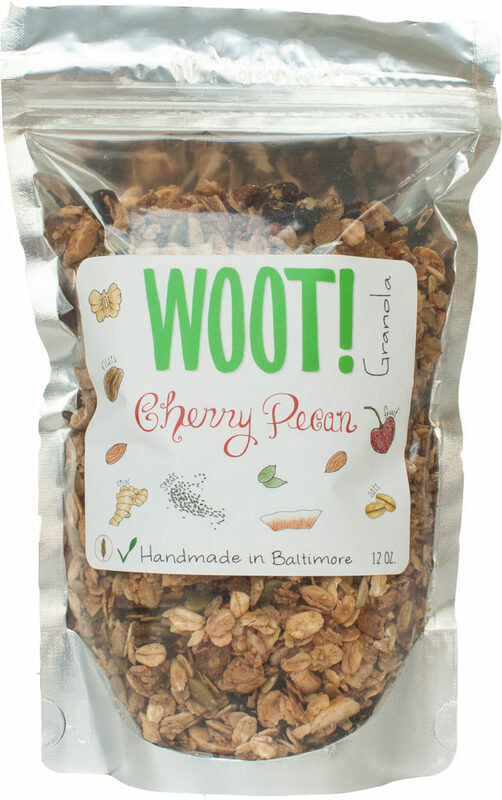 A rich and luxurious mix of sweet-tart Michigan cherries, pecans, spicy-sweet ginger, crunchy nuts and seeds, a touch of Maryland Maple syrup and cinnamon.